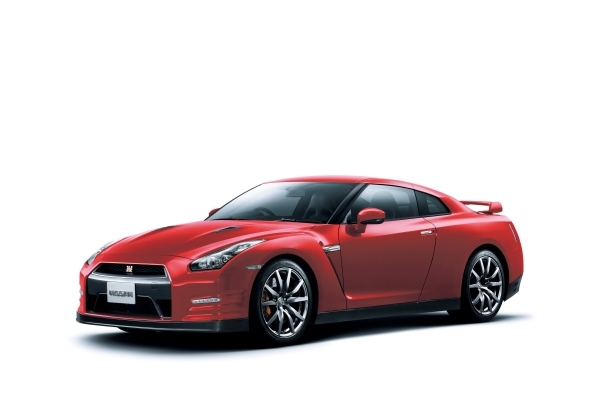 Motortrend has posted pictures of the face lifted 2012 Nissan GT-R at Nurburgring. A few days ago, pictures of camouflaged examples started showing up on the internet, and now we see some of the minor changes for the 2012 year in the US. The car shown here is a SpecV, however rumors have been that the SpecV has seen its last years. Perhaps the Mspec ? At the front we can see the dual front canards, and the reshaped upper front grill opening. Ian over at NAGTROC posted up a great comparison shot of the 2009-2011 R35 GT-R front bumper vs the 2012 front bumper. If you have seen a few of the Nissan GT-R race cars, even the STILLEN Nissan GT-R, you will see additional vents in the area blocked by the standard bumper/grill. For 2012 this area is opened up. In addition, the airflow to the intercoolers has been expanded with a larger opening. Behind the rear tires are some small openings, and the rear diffuser has been revised. This car, being a SpecV or some equivalent has the lightweight titanium exhaust that was first seen on the Nismo Sports Club Package.